The story of the founding of Greeley, Colorado, is an interesting one. It was named for New York newspaperman Horace Greeley (of “Go West, Young Man” fame) who visited the area in 1859 and declared it would make fine farmland. Before becoming the City of Greeley, however, it was established as an experimental utopian farming community. 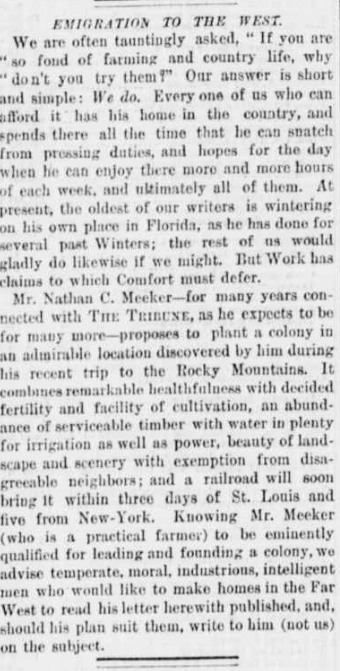 Meeker’s ad in the New-York Tribune, December 4, 1869. 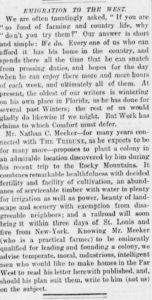 The advertisement drew a huge response, and in 1870 Meeker and more than a hundred others settled in the new community. They set up extensive irrigation systems, and their success at farming, along with proximity to the railroad, attracted many more settlers. In 1886 the Union Colony changed its name and was officially incorporated as Greeley. However, the former temperance colony remained dry until 1972. Horace Greeley himself never lived in the colony, and Nathan Meeker was killed by Indians in the famous Meeker Massacre in 1879 (that’s a story for another Tuesday). Meanwhile, the town thrived, becoming the largest municipality in Weld County. The State Normal School (now the University of Northern Colorado) opened in 1890, and the city is still closely associated with agriculture. You can read the fascinating story of the Union Colony in an old book available digitally from our library. The Union Colony at Greeley, Colorado, 1869-1871, was written in 1918 by Dr. James F. Willard, a history professor at the University of Colorado in Boulder. The nearly 500-page book includes not only a history of the colony, but reproduces many primary documents such as the minutes of Meeker’s Union Colony Association; detailed financial records; bylaws; deeds; correspondence; newspaper excerpts; and more. The book also contains a list of original settlers, including where they moved from, their date of arrival and how many members were in their family (as self-described; one man listed himself as “old Bachelor.”) Willard’s book is an essential resource for anyone researching the history of Greeley and the Union Colony — and it is now easily accessible to anyone online.